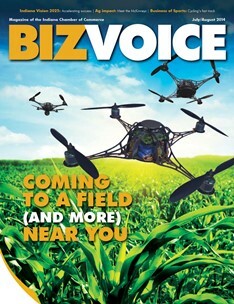 Today, we’re unveiling our July/August edition of BizVoice magazine. And the headline is actually a joking nod to our cover story about drones… assuming they make some sort of buzzing sound as they fly. If they don’t, well, let’s just ignore it and move on. This entry was posted in BizVoice, Business News, Chamber News, Education, Technology and tagged agriculture, BizVoice, cycling, drones, Education, Evansville, indiana, kent parker by Matt L. Ottinger. Bookmark the permalink.